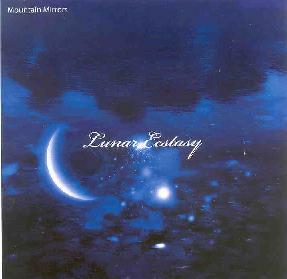 Mountain Mirrors - "Lunar Ecstasy"
Mountain Mirrors is a solo project from musician and songwriter Jeff Sanders, who plays a trippy and passionate brand of mostly song oriented psychedelia. The CD opens with "A Short Burst Of Clarity", which features a cool combination of drugged dancey vibes and psych-rock, including tasty trip guitar licks and efx. The title track follows with more downbeat grooves, grungy rock guitar chords and a ripping solo, and backed by freaky efx that nicely color the song. "Your Sacred Space" is an acoustic song that the promo sheet notes was inspired by Nick Drake. I hear the similarities though Sanders isn't as somber as Drake. A gorgeous song. Sanders' love for Vangelis' soundtrack work is apparent on the spacey, keyboard driven "Apparition". "Afterlife" is a beautiful instrumental, this time with orchestration that is both heavenly and majestic. But songs like "Where The Green Meets The Blue" and "Last Resort" feature the song style I most like to hear from Sanders. The former features folky psychedelia that is in some ways so basic, yet delivered with passion and evolves through a surprising number of themes in less than 4 minutes. Lots more happening here than appears on surface. And I dig the tribal drumming that adds an extra kick to the song. We get more of the same on "Last Resort", except on this tune Sanders takes off into DEEP space for a cool grooving head trip experience with lots of freaky, winding efx and a seductive melody. My hands down favorite of the set. Parts of "Agent Orange" remind me of Pink Floyd (circa The Wall), but we've also got a rocking Stoner vibe and e-bow from guest Nick Bensen (whose own music bears similarities to Mountain Mirrors). Another excellent song. And the CD closes on a relaxing note with the solo acoustic "Rain". In summary, Sanders accomplishes a lot in a mere 31 minutes and is at his best when playing acoustic based psychedelic songs augmented by various instrumentation and efx. His strength lies in his delivery and the simplistic but imaginative structure of the songs. Not every track grabbed me hard, but the good stuff is very good. For more information you can visit the Mountain Mirrors web site at: http://www.mountainmirrors.com.